Logistics Marketing Group offers several SEO services for small to medium sized businesses that are able to fit into any budget. Our team of SEO professionals will work with your business to develop a SEO services strategy specific to your market niche to increase your web traffic and drive sales. 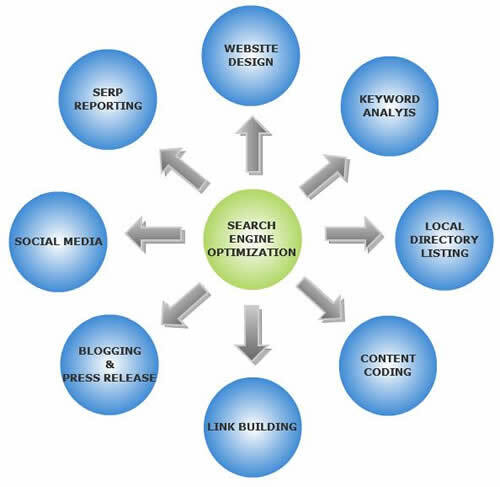 Search Engine Optimization (SEO): Logistics Marketing Group will optimize your website so that customers can find you in the “organic search” or the body of search engine listings. Our goal is to get your website (online storefront) at the top of several key search engine listings, in order to drive traffic (customers) to your website. SEO services are a very cost effective form of advertising that targets a much larger audience. Many businesses have websites that nobody can find because of a lack of SEO services. A website without successful SEO, is the same as having your website floating in the middle of a vast ocean. This is why your business needs the expert team at Logistics. Logistics Marketing Group will ensure that your customers can find you 24/7. Keep in mind that SEO takes a little time to come into effect. However, once your website is optimized, your business will have a significant increase in return on investment. Website Design: Don’t have a website or need a website “facelift”? Logistics Marketing can customize a website to fit your business’ needs. We will design a professional website that represents the message you are trying to convey to your customers. At the same time we will optimize your site into a website that is easy for customers to find and use. We can also put e-commerce payment methods on your website, so that your customers can pay you right on your website. Social Media: Logistics Marketing Group can implement a social media campaign which would allow friends on Facebook and followers on Twitter to receive information about your business. We will create a Twitter account and Facebook page that links to your website. You can run daily promotions or specials for all of your friends or followers to see, as often as you would like. This is an excellent way to stay in front of your existing clients and find new ones. Key Word Analysis: Logistics Marketing Group will research to find the top key words (searches), that will yield the highest conversions for your business. The correct key words are vital in driving business to your website and increasing your revenue. Link Building: Logistics Marketing Group will develop a linking strategy that will drive traffic to your business and help optimize your website. What is a link? Links are like clickable texts that act as portals, connecting two websites together. A person can click on a link displayed on one website and be instantly directed to another website. Why are links important? The more sites there are linking to your website, the more relevant you are to Google. However, it is important to note that you must implement links over a progression of time or Google will “flag” your site, hindering your ranking. You also need to make sure you only receive links from high quality websites to ensure that Google views your website as high quality. Performing this feat is no easy task. That is why you need our expert team to implement your linking strategy. Site Map: Logistics Marketing Group will create a sitemap for your website. What is a sitemap? A sitemap is a website’s virtual map that search engines read or “crawl”. Having search engines crawl your website is what makes your website optimized. Many websites don’t have a sitemap, making the search engines unable to “crawl” the websites or causing them to incorrectly crawl the websites. As a result, those websites will have no ranking with search engines and they will not be optimized. Not having a sitemap on your website would be the equivalent of going to a house with no door. Logistics Marketing Group will make sure you have a sitemap that is search engine friendly, allowing your website to be crawled, ranked and optimized by search engines.